M-V-P! M-V-P! M-V-P! Dominate the map all over again to earn Flashback Joe Mauer in a new set of Conquest Missions, plus check out the details for the next Ranked Season and the new Diamond Legends headlining Set 10 Standard Packs. Two players who appeared in this summer’s Home Run Derby have slugged their way into the Diamond club in this week’s Roster Update, plus the Ticket Counter brings back coveted Flashbacks and new Double Legends packs are available in Diamond Dynasty. Left-handed flamethrowers lead the new Monthly Awards Flashbacks, Set 9 features two Diamond Legends, and get the new Roster Update with all of the trade deadline deals. 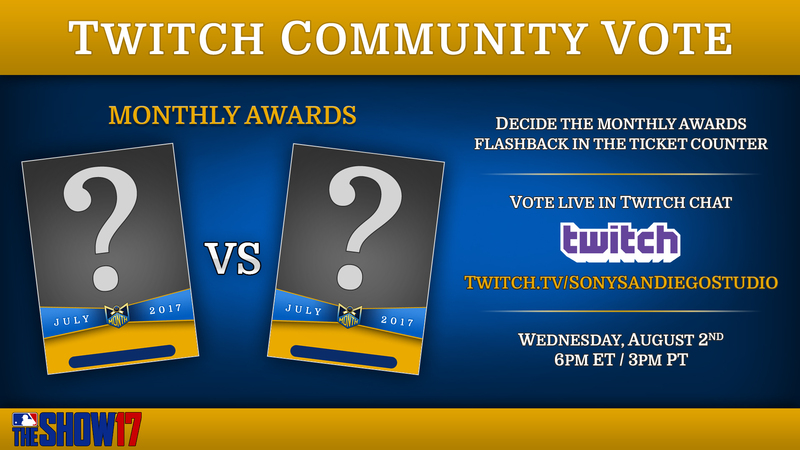 Join the Live Content Team on Wednesday with hosts Ramone, Stephen and Luis for an early look at the July Monthly Awards Players that are coming out Thursday. Take a ride back in time to match the dominating performances of baseball Legends in two new Diamond Dynasty Programs, plus MVPs are among the new, must-see Battle Royale rewards. 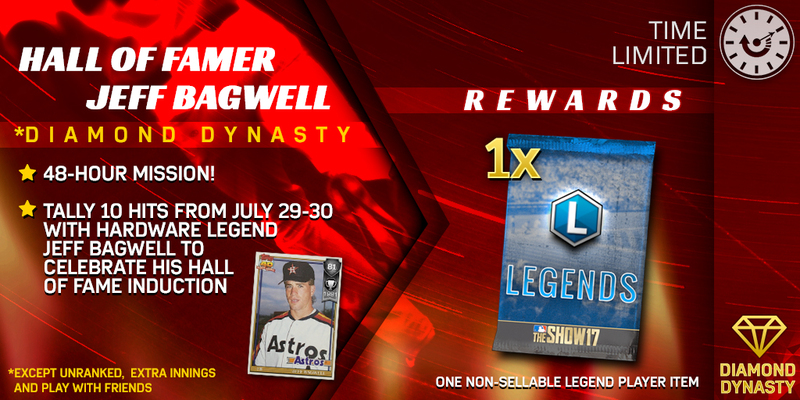 As the Hall of Fame welcomes new members this weekend, we salute the career of Jeff Bagwell with a Time Limited Mission, plus check out the latest Roster Update, fresh Diamond Legends and the Advantage: Pitchers Event gets underway. Dominating pitchers will rule the diamond in the Advantage: Pitchers Event with a 99 overall reward on the line. Face all 30 MLB teams in the new All-Star Epic to earn a 99 overall Flashback reward, discover the newest Diamond options in the Ticket Counter, plus MLB trades shake up this week’s Roster Update. A major All-Star break Roster Update includes 50+ players, plus Ranked Season Stripes features two 99 overall rewards and Packs in a Pack returns. Rival leagues face off in the finale of the All-Star Summer Events!